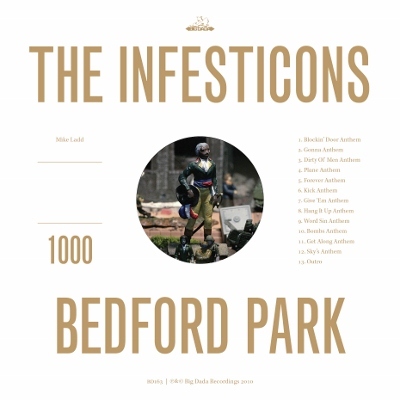 Bedford Park is a long overdue coda to a project poet, rapper, and musician Mike Ladd began way back in 2001. Back then, he posited Infesticons as a revolutionary force battling corporate interests and mainstream sellouts (or “Majesticons”). He’s still righteous – check out the M.I.A.-inspired “Bombs Anthem” – but his palette has expanded beyond East Coast underground rap and electro-funk. R&B (“Forever Anthem”), avant-rock (“Blockin’ Door Anthem”), and even a trap rap parody (“Hang It Up Anthem”) fuel this scattershot yet undeniably exciting exploration of the contemporary music scene. This entry was posted in Reviews, Short Cuts and tagged Big Dada, Infesticons, Mike Ladd, Rhapsody. Bookmark the permalink.